Fume Scrubbing System at Allomatic provides 95% emission control efficiency. Although Indiana’s environmental protection agency has not yet added hydrochloric acid (HCl) standards to its Title 5 regulation of emissions sources, Allomatic Products Co., Sullivan, IN, was determined to erase HCI vapors from its plant discharge. In the mixed industrial/ residential neighborhood where its manufacturing plant is located, Allomatic wanted to be known as a good neighbor. The unwanted emissions were not a new problem. 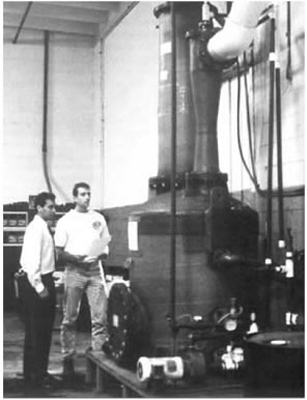 Allomatic had installed a “bubbling” scrubber in 1992 to address the HCl concern. The rudimentary device was intended to provide some remediation by routing fume laden discharge air through water in a 55 gal tank. Unfortunately, it wasn’t doing its job – tangible evidence of this was the damage to trees and other greenery outside the manufacturing plant. In cool weather, the problem went beyond company property as noticeable odors drifted through the surrounding neighborhoods. In addition, at times, the discharge plume may have exceed the permitted opacity limit. Plant management wished to remedy the situation, both to be a good neighbor and to achieve long-term compliance with Indiana regulatory limits when they eventually are set. Fathauer knew that some form of wet scrubbing was needed to solve the acid gas problem, but he wanted to be confident that the system he selected would have the capacity and flexibility needed to accommodate future production increases. After investigating several alternatives, Fathauer turned to the Clean Air Group, LLC, an air pollution control equipment and systems manufacturer that offered custom designs calculated to meet the desired service requirements. 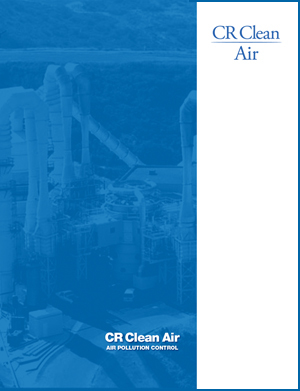 Mark Grossman, an applications engineer for the Clean Air Group, suggested a system combining a venturi-type wet scrubber with a packed scrubbing tower. “The two-part system would combine optimum, efficient operation at Allomatic’s present loads with the ability to handle increased loading when needed,” Grossman explained. As designed for Allomatic’s process, the Clean Air Group’s venturi scrubber removes approximately 90% of the hydrochloric acid from discharge, and a packed tower tailgas scrubber removes a high percentage of the remaining hydrochloric acid at its specific design conditions (efficiency can vary as capacity fluctuates). The system is designed to operate with water or caustic scrubbing medium, and the recirculated scrubbing medium flows at 30 gal/min to the venturi and 10 gal/min to the tower. Because two scrubbing mediums may be used, Allomatic’s system was constructed of materials suitable for either medium: FRP resin for the major equipment to withstand both concentrated acid and caustic, Hastel-loy recirculating and metering pumps, and CPVC piping. The system was installed in June 1996 during a one-week plant shutdown and was supervised by in-house personnel. The old tank was removed and existing ductwork and headers were replaced with new equipment calculated to minimize pressure loss. The HCl removal system went on-stream in July 1996 with few problems. During startup, only a variable speed fan used to achieve the higher airflow option required adjustment. The scrubber system now operates 24 hours a day, four days a week, and is expected to be online 50 weeks each year. “Performance is exceeding expectations – at present capacity, the system is operating at better than 98% efficiency,” Fathauer added. Presently, to meet production requirements, the etching machine is filled with new acid on Fridays, just before the plant is shut down for the weekend. When production begins again on Monday, the HCl concentration is strong, then gradually is reduced through the week.